TAINAN, Taiwan – The Chinese Taipei U-12 National Team defeated fhe United States, 11-6, Friday night in a second round contest to earn a ticket into Sunday’s world championship finale of the WBSC U-12 Baseball World Cup. Chinese Taipei and the U.S. had both entered Friday night’s match-up undefeated and were the top seeds advancing from the opening round field of 12 nations. The Chinese Taipei and U.S. U-12 National Teams had last collided in the finale of the 2013 U-12 Baseball World Cup, which saw the U.S. return home with the world championship trophy. 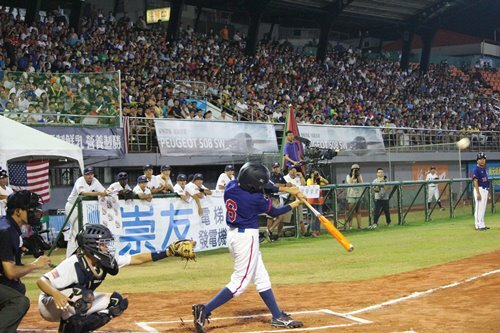 The winner of the Friay night's battle was to earn a place in the grand finale of the 2015 U-12 Baseball World Cup, setting the stage for a ‘Clash of the Titans’ for the more than 7,000 fans in attendance. With power-levels fully charged and the electrifying atmosphere Tainan Stadium Friday night, Chinese Taipei and the U.S. received a jump-start, making for a wild first inning that saw both starting pitchers removed and seven runners cross the plate. Chinese Taipei stormed out a 4-0 lead in the top of the first and the U.S. countered with three runs of their own. Chinese Taipei added a run in the second, and the U.S. struck for two runs to tie the game, 5-5. Using 15 hits and a big top of the 6th inning, Chinese Taipei managed to win the heavyweight battle with the U.S. National Team to earn an early ticket to play for the U-12 world title on Sunday. Chinese Taipei never trailed in Friday’s contest. It was the first time in 2015 U-12 Baseball World Cup that the U.S. National Team was behind in the score. On the eve of the U-12 Baseball World Cup finale, the U.S. will face Cuba, and Chinese Taipei will take on Nicaragua. Japan and Venezuela have already been eliminated from gold medal contention. A win by the U.S. against Cuba would set up a rematch between Chinese Taipei and the U.S. in the finale. 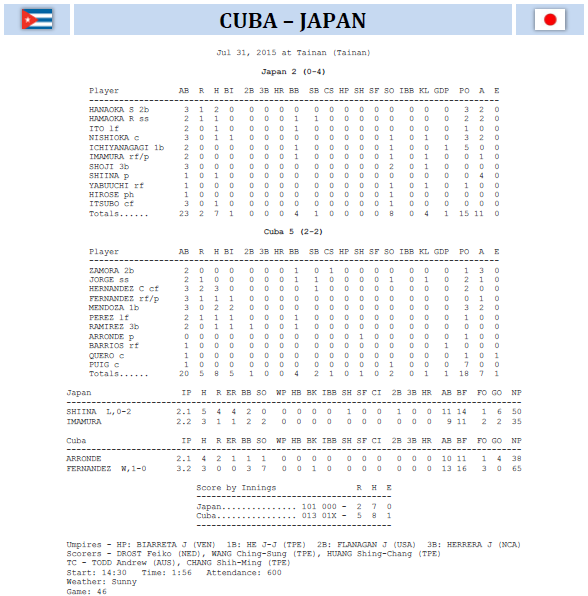 Cuba can advance to the finale with a win against USA and with a win by Chinese Taipei over Nicaragua. 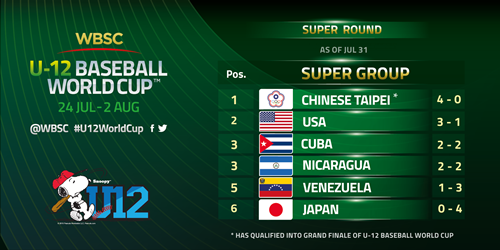 Nicaragua will need Cuba to win and to beat undefeated Chinese Taipei to set up a three-way tie in the Super Round standings between Cuba, Nicaragua and USA, in which case WBSC U-12 Baseball World Cup tournament officials would make calculations from the scorecards to determine who was the best ‘on paper’. The finale of the WBSC U-12 Baseball World Cup is scheduled for Sunday, 2 August at 18:30.